﻿Don't have a wall to display my current project...the table in my parents home holds Kordova Klosure right now. I've got so much more to do on each of these steps, hey it may not be much progress but I'm trying! 244 black/neutral hour glass blocks are needed for Step 1. I've got a bunch of strips cut to size waiting on the EZ Companion Angle. As I start the day 99 are finished. They go together quick, should be able to catch up real soon with the clue that was released first on November 18th. 72 blue string blocks are needed for Step 2. This clue was released on November 25th. As with Step 1 I have lots of strips and strings and foundations ready. Only 56 more to catch up here. December 2nd is looming along with the release of Step 3...I'm going to be pretty busy catching up with everyone. I certainly like what I'm seeing so far. 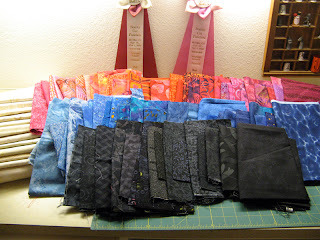 What's going on in your sewing room? 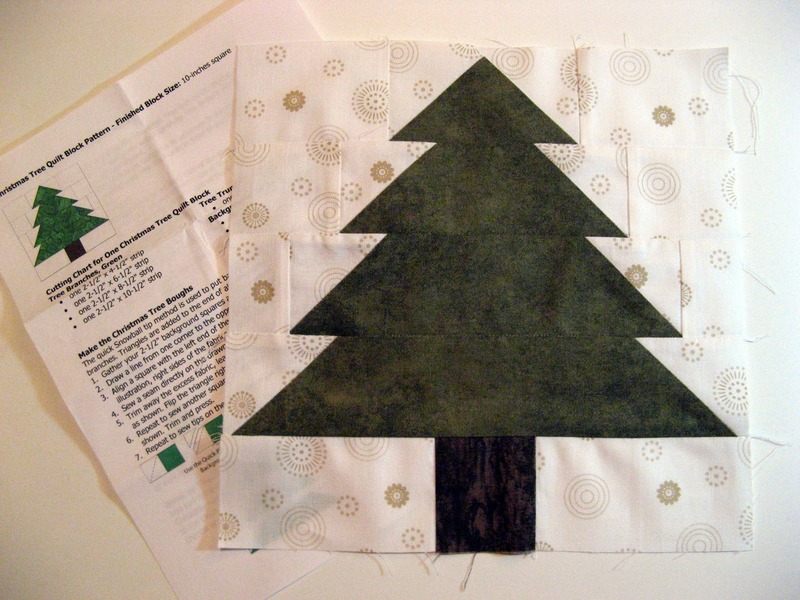 More fantastic projects can be seen via Patchwork Times. Until the next time, enjoy the project you are working on. I've not had much time for sewing this week. 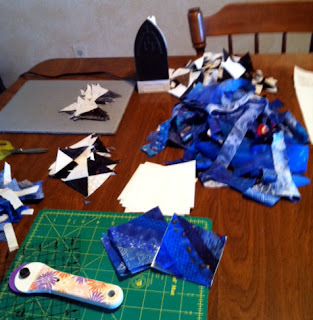 Was able to get a little sewing on Kordova Klosure the day after Thanksgiving and a little bit today. I'm doing more family things and enjoying every minute of the time. For me these opportunities don't take place often enough. My sewing on Friday was at my sister's work. 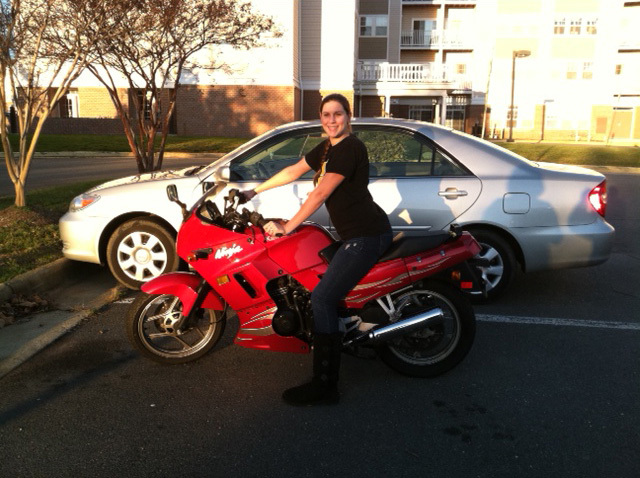 She is an Assistant Principal at a day care center which unfortunately had her working. I set up the Janome Gem Gold 2 on a kids work table with a chair that nearly had me sitting on the floor :)! 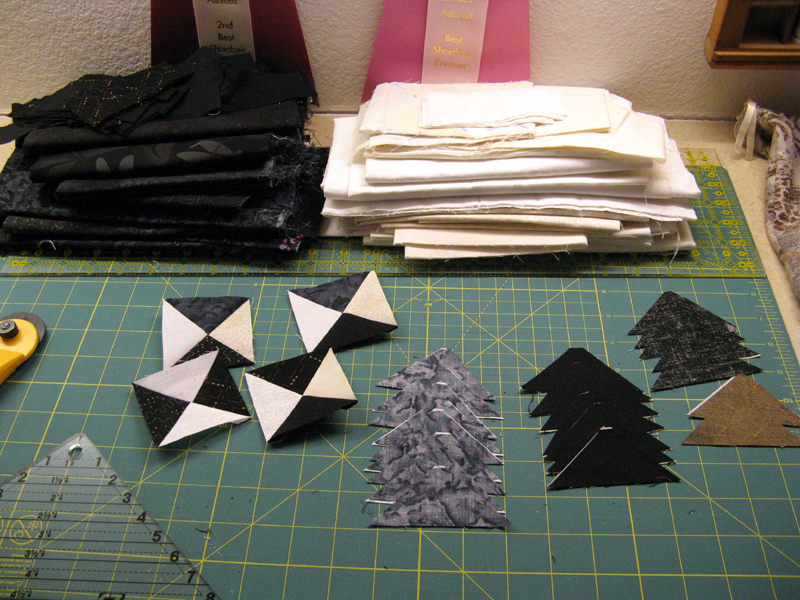 After several hours and the help of my niece; 99 Step 1, 2.5" hour glass blocks were cut, partially sewn and pressed. 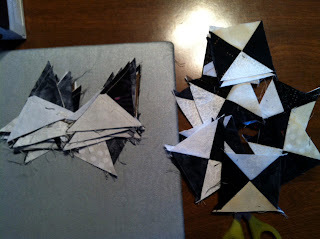 Today I've been working on Step 2 while chatting with my Mom. I raided her blues to add a bit of variety to my strings. 16 blocks down and 56 to go. For this week no change! Hope your holiday was extra special. This was on my Design Wall last week. It was made as a remembrance for my parents of our Thanksgiving Family Reunion that we are celebrating this week. The quilt is intended to be a table topper, but I put a hanging sleeve on it just in case. I enjoyed putting the turkeys together the most. Are you eating less today? Saving lots of space for all the good things that may be cooking already...umm I can already smell pumpkin pie! Hope you have a wonderful Thanksgiving. I'm well on my way with Bonnie Hunter's Orca Bay Mystery. This clue has us taking our dark (mine is black) and pairing it up with our neutral. I'm using the companion ruler so I start with 1.5" strips. I'll be making 224 hour glass units. I'm going to do my best to keep up with the release of each Clue. This will definitely be a challenge considering all the goings on with family. There has to be time in the wee hours of the morning to make a bunch of these 2.5" hour glasses. Check out other quilters' sewing projects today at Patchwork Times. I leave this afternoon for nine days. There's a big family reunion at Mom and Dad's home in Maryland. At last count I think there will be 15 sitting down for a fabulous Turkey Feast. There's going to be a full house for a few days! I'm so thrilled to be spend time with everyone. I'm sure there will be lots of good food, fun games, and laughter. This week I pulled fabrics for projects that I might find the time to work on during my vacation. I plan to work on my November UFO Kourageous Heartsease flower. I also pulled fabrics for December UFO Violets. Here's the fabric selections I'm going with. 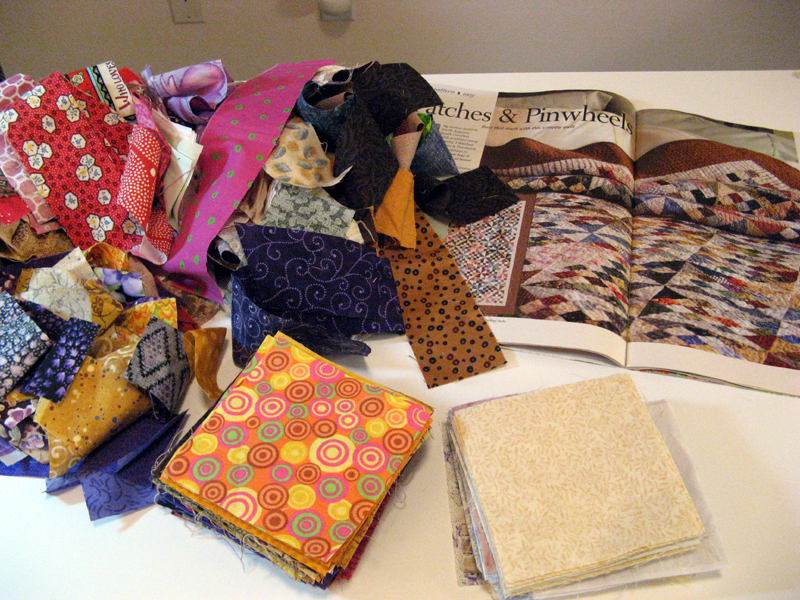 Next I gathered fabrics for Patches and Pinwheels. 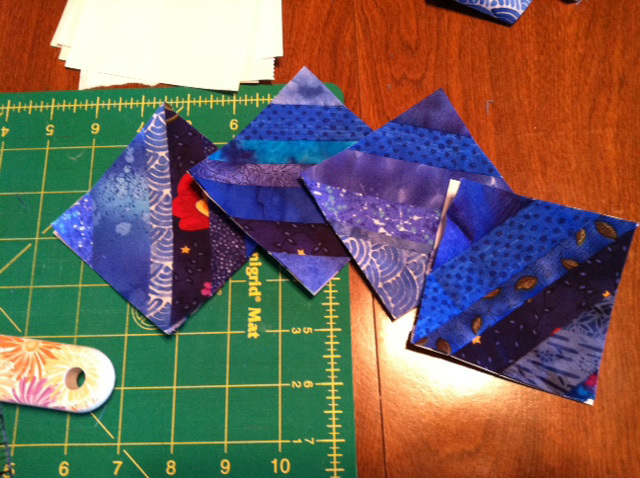 I did find time to cut the squares and mark the diagonal line on the neutrals that will be come HSTs. The strips are cut at the right size for sewing into rows of four and then cross cutting them into strips which then get made into a bunch of 16 patch blocks. I was busy this week and will claim the yardage used. Check back later in the week to see what I did! 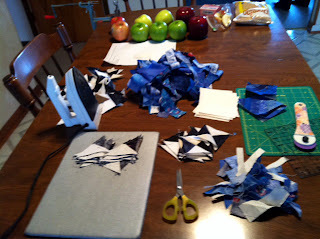 Here's the start of my Bonnie Hunter Orca Bay Mystery 2011. I selected the colors she's suggested in the Introduction that is available now on her website. I was considering cheddar, yellow greens, and dark browns at first thought. I do like these colors together and I can always use a little room in the three tote pans these fabrics came from! Besides I don't presently have a quilt in these colors. Why not? Clue 1 comes to us on Friday, November 18. I'm ready! I'll have something from this mystery on my Design Wall next week you can be sure. Find time to look at other quilters' Design Wall by way of Patchwork Times. Happy sewing everyone. Here we are the middle of November already. Where does all the time go? Before you know it we'll be bringing in New Year's 2012! 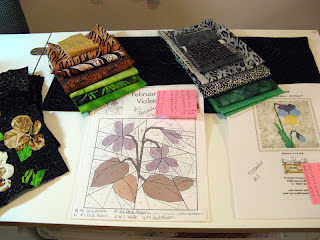 Last week was Sunshine Quilt Guild monthly meeting. This was the block of the month up for some lucky participant to win. I was hoping it would be me. There were perhaps 30 blocks made that the winner would take home. Each and every one different; some embellished. I didn't win, but fortunately for me I should get a chance to see the blocks made into a quilt because Kerry won them. Lucky her! 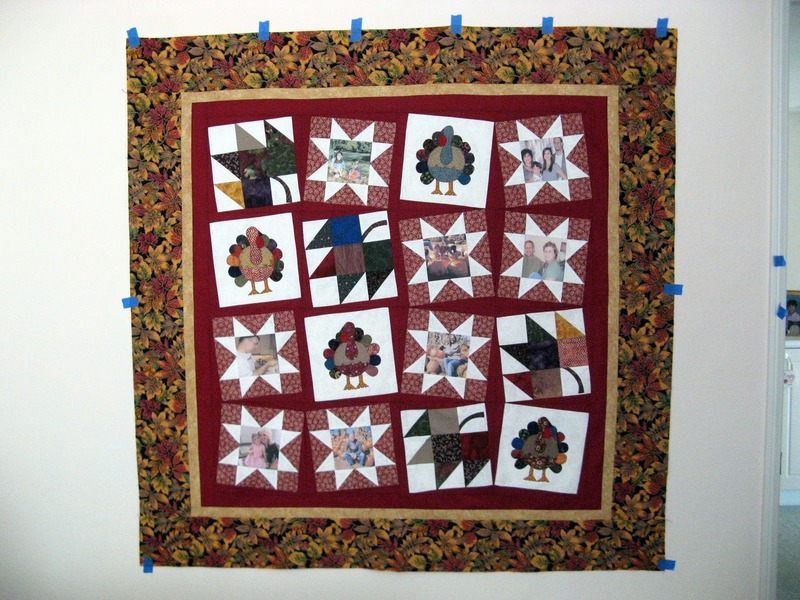 Did you have a chance to participate in the Quiltmaker 100 Blocks Volume 4 Blog Tour? I did and won a copy of the special issue. The magazine will be available on bookshelves on Tuesday, 11/15. Be certain to pick up one. As in volumes before this issue it is filled with 100 block designs from as many different designers. This year's volume has several different layouts...and the tour had all sorts of prizes to win by visiting the designers between Monday, 11/7 and Friday, 11/11. No activity using up stash this week. I've been working on a surprise gift this week...can't give it away just yet! I have also included photos taken of Kolonial and Kondor's Klutch not draped over a chair. This way you can see the pattern design of both. Thanks again Bonnie for a wonderful pattern. ﻿﻿﻿﻿I'll be working on quite a few things this week. Heartsease is the Kourageous block for November. UFO #3 with Patchwork Times. It is a design by Claudia Hasenbach. I'm not sure what fabrics yet I'll be using but I do plan to start pulling them later today. 17 sections and 61 pieces make up this flower block. Not too bad! 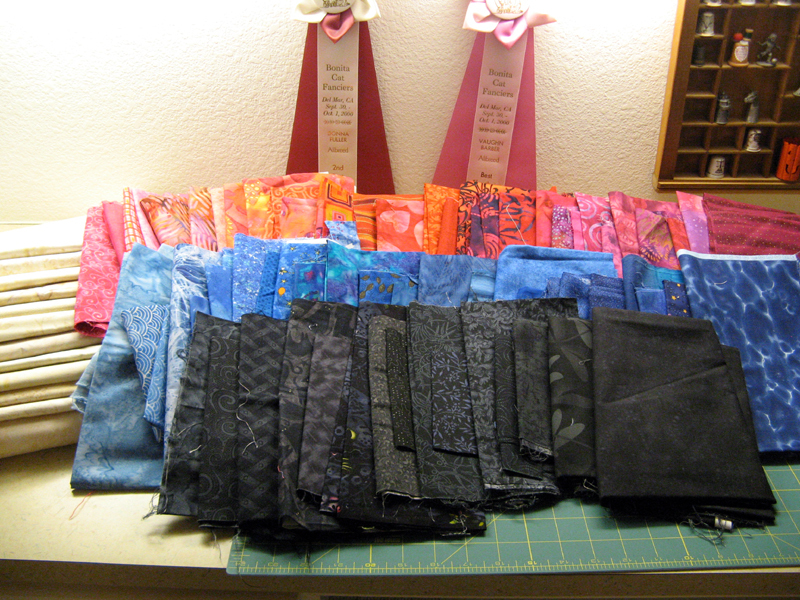 Katnip Krazy is off to Kerry's Quilting! This Buggy Barn Pattern called Crazy Cats turned out real cute. 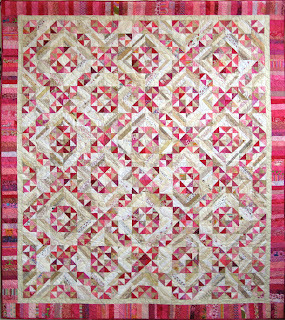 I really like the Julanne Bergstrom designed border; it really puts the perfect finishing touch on the quilt. Julanne suggested the gray ears; just perfect! Mouse tails will be sewn in during the quilting. This is what Kerry will be adding along with an all over design that has yet to be figured out. I'm thinking about a small scale dragon fly. Gray thread will be used for all the quilting. Surprisingly the gray looks great; certainly not what you'd think if you didn't have the quilt and the thread in your hands. 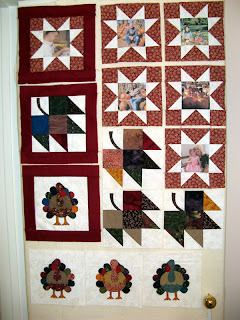 Check out other stash reports at Patchwork Times! 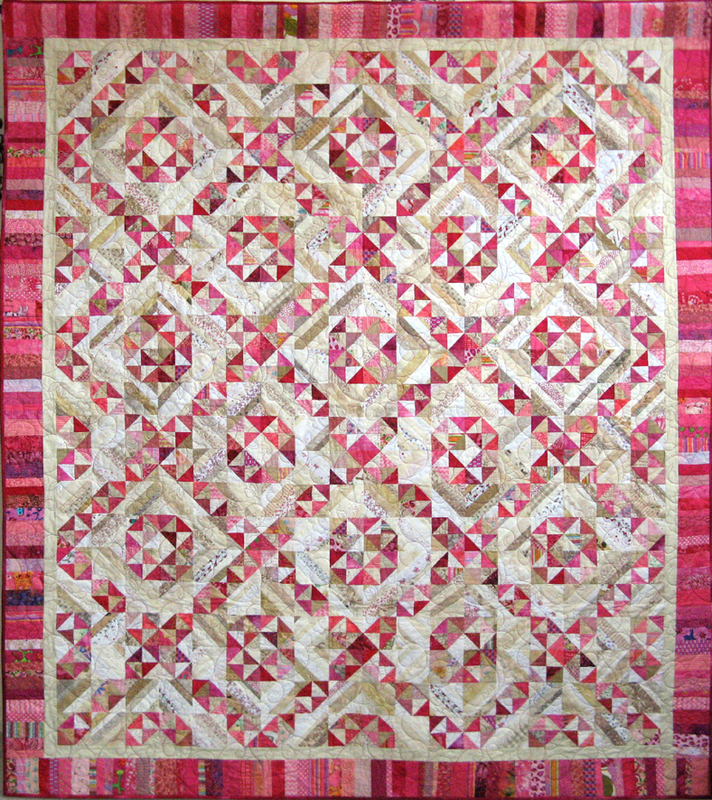 Don't forget to join in the fun Quiltmaker's 100 Blocks Volume 4 Blog Tour starts tomorrow. Happy sewing this week. After putting together the Pansy flower block this one was a walk in the park. It had just 89 pieces that made up 18 sections for this 6" block. It's not the show stopper like other flower blocks before, but hey nothing is wrong with simple! Add them all together through October and you'll see it isn't quite so plain to look at. Kourageous is coming along nicely. For November's UFO Patchwork Times selected #3 which is my Heartsease flower by Claudia Hassenbach that will go nicely with Kourageous. I've not had time to count the pieces and sections yet. It does look simple though similar to the Meadow Buttercup flower. Since November has been selected...December has been revealed to be the #12 the Violet block by Linda Causee. I still have others that I may include which are a thistle, a magnolia, a calla lily, a morning glory, an orchid, and still three more that I have found patterns for. We'll see what develops. In the mean time head over to Patchwork Times to see how everyone else did with finishing up their October UFO.